Tom White originally studied archaeology at the University of Durham, developing a particular interest in the Lower and Middle Palaeolithic periods. Following an MA in Prehistory, he worked for three years as a Research Associate on two English Heritage-funded projects, examining the long-timescale Pleistocene records of the Trent basin and the Fenland rivers. 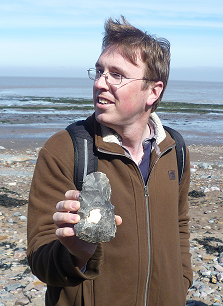 His transition to Quaternary scientist was completed during his NERC-funded Ph.D. at the University of Cambridge, which saw him specialize in Pleistocene non-marine molluscs and ostracods as proxies for palaeoclimate and as a means of reconstructing the environments inhabited by early humans.